You are here > Blog > With Salty Eyes > Tribute to an old hero! This “little guy” has been backing us up over a significant and challenging amount of time. It has reached it’s limits more than a few times carrying trailers, roof racks full of sea kayaks, equipment and ourselves together with our enthusiasm to go out paddling in any conditions given, our morale and determination that kept it running! 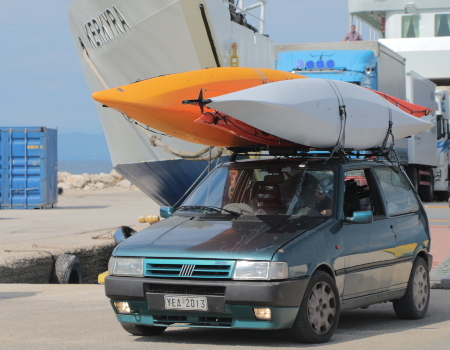 I’ve reached the conclusion that after all, it must have been all about that determination and optimism that resulted in keeping our old Fiat Uno covering the distances around Greece restlessly and so many hilarious and epic stories having been born through those miles! Reading this, it ‘s possible that some of you have experienced the thrill at some point and can recall a few and laugh now! With a history full of imaginative quick fixes, on the field repairs and demanding mileage, bizarrely this is a car that made us proud; proving its heroic genes, powered by our care and quest for adventures. If your car is not a bit rusty, full of sand samples from all around, salty seats, scratched by branches, stuck, towed (if not towing), pushed, heavily loaded, bit oil burning, rebuilt, self- locking/unlocking (randomly) and always ready, well… it cannot qualify as a “proper” expedition car! Yes, it was a proven one! The little “guy” will no longer serve us as a backup from now on and it will soon find it’s way to the recycling process. Sad but about time! It has always been a winner and somehow, even teached me a bit!